When Suraiya passed away the nation was stunned into silence. Thereare many immensely gifted singers, and there are many immensely giftedstars. But no individual combined the two seemingly incompatible worlds in such a magical web of melody and histrionics. If Suraiya was a very accomplished singer she was also one of the most popular and acclaimed actresses of her time. Almost all her songs were self-sung on screen. That again made her unique. In a world where actresses soon came to project beauty on screen through predominantly one voice, the voice of Lata mangeshkar, Suraiya was her own person, Stately coy and compelling. If Suraiya remained untouched by the sweeping sonority of the Nightingale’s voice it was because she created her own idyllic world of spiritual synthesis between body and soul in one persona. 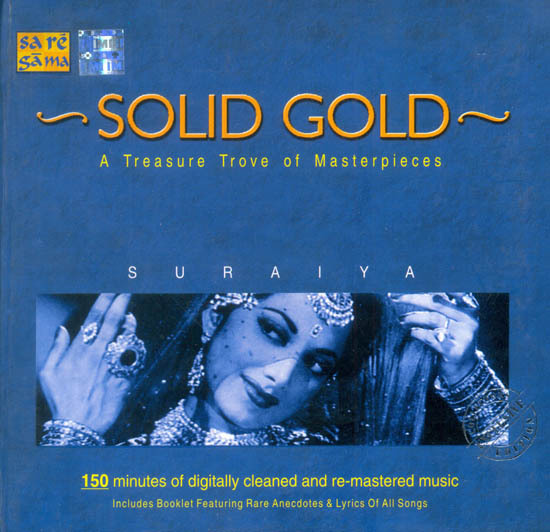 And look at the breathtaking lineup of songs that Suraiya sang to ever-lasting fame? From Ek tu ho ek main hoon in Kanoon in 1943 to Yehkaisi ajab dastaan ho gayi in Rustom Sohrab in 1963? Suraiya Jamal Sheikhaka Kamal remains bemisal! Lataji pauses to recall the face that launched a dozens of successful ditties on screen. “Suraiyaji sang mostly her own songs on screen. She hardly did playback singing for others. In my opinion she was a very refined actress. Truly gifted? Her acting was subtle and sensitive. She always looked dignified and cultured. She was incapable of seeming faltu on screen. I remember seeing her singing a Iocomotive song during my childhood in a film called Station Master. All us kids had gone with our mother. For weeks and months after I’d do that train song at home with a toy train on a string. In our heydays she’d be busy with her shooting all day long? I’d be busy in the recording rooms whereas she was in and out of sets? I gave up acting during my childhood. Mujhe acting ke naam pe ghabrahat si hoti thi? Suraiya was slightly older than me? I think I met her for the first time when we had to sing a duet. After that whenever we’d run into each other she was affectionate. I remember meeting her once during her heydays as an actress. When she told she was cutting down on her acting assignments I told her not to doso. But she said she was tired of acting. ‘Man nahin karta hai. The sense of passionate propriety in her renderings is amazing. As her super-hit songs from Mirza Ghalib, Afsar, Dastaan and of course Anmol Ghadi spil out in a cascade of advancing ecstacy, the album gives us the feeling of being in the center of a sublime and sensuous experience.